I have changes!!! Eight months later…. and the Lord is taking me out of Juayua. My companion, Hermana Funez is going to train! I am really excited for her, and I know that she will be great! I have no idea what is going to happen for me, but we will see. I am really excited to keep working. The mission is going so fast, I cannot believe that this will be my last area!! This week we went on intercambios with the sister training leaders. 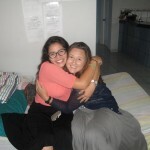 I got to go visit with Hermana Arrieta! I love this sister so much! She was hermana Steels comp before she came with me. I got to spend a great day in Ahuachapan, meeting people and teaching powerful lessons. Really, it was a great little boost, and I learned so much! Wow, what a week. We have been trying our hardest to prepare the area for changes and make sure that Hermana Funez is prepared. She is super awesome and I am excited for her to train! I know that it will be really good for her. She is developing good relationships with the members and I know that the future is bright here in Progreso. We have shifted our focus a little bit in the ward, we are going to be heavily focused on reactivation and retention. The sisters are going to be helping the families visit their assigned families, and we as sisters are going to receive a visiting teaching assignment. We hope that as we help the members learn to visit and serve each other that their desire to reach out and serve nonmembers will increase. I am excited to see what the Lord has in store, and I am excited to keep working.